Published on March 28, 2019 in Winnipesaukee Resort. Closed Tags: family adventure, Lake Winnipesaukee Resort, Maple Syrup, Prescott Farm. Spring has finally arrived and as the warmer weather starts setting in, the sap starts flowing! Here in New Hampshire, the month of March is considered New Hampshire Maple Month, the period where the majority of the maple sap harvest is collected and processed into maple syrup. Although New Hampshire Maple Month lasts only 31 days, the maple harvest typically spans from mid-February to mid-April producing over 160,000 gallons of syrup throughout the state of New Hampshire annually. This year, over one hundred sugar shacks across the state are participating in NH Maple Month 2019, some of which are right in our back yard! Prescott Farm, located within walking distance from the Summit Resort, is a nonprofit organization devoted to environmental preservation and education for all ages. 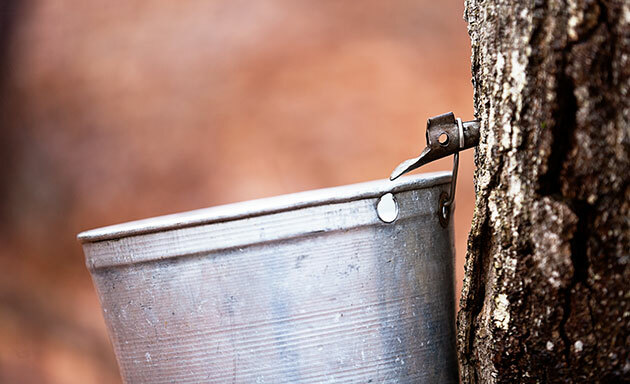 Every Saturday throughout the month of March, Prescott Farm hosts an event titled “Tap into Maple” where you can experience one of New Hampshire’s oldest traditions. During the program, educators teach guests about each step in the sugaring process with hands-on learning opportunities. The class covers identification of the appropriate trees, the proper tools used to tap (including some historical equipment and methods), the technique used for sap collection and the chemistry behind the boiling and production process. Prescott Farm’s event calendar lists all of their upcoming events including their Maple Everything event taking place on April 20th where you can join the local 4-H group and learn both traditional and unconventional uses of maple syrup. Another local farm participating in Maple Month is HT Farm located at 60 Federal Street in Belmont, New Hampshire. Only a 20-minute drive from the resort, HT Farm produces maple syrup at their onsite sugar house and is also the home of registered belted Galloway beef cattle during the winter months. Tim Duval, owner of HT Farm, taps from the maple orchards at our sister resort Steele Hill, located in Sanbornton, New Hampshire. Tim also raises the cattle and calves at the resort’s pristine pastures atop Steele Hill Road during the summer months. Stop by the sugar shack to see their brand-new machinery and learn about the filtering, boiling, and finishing processes. 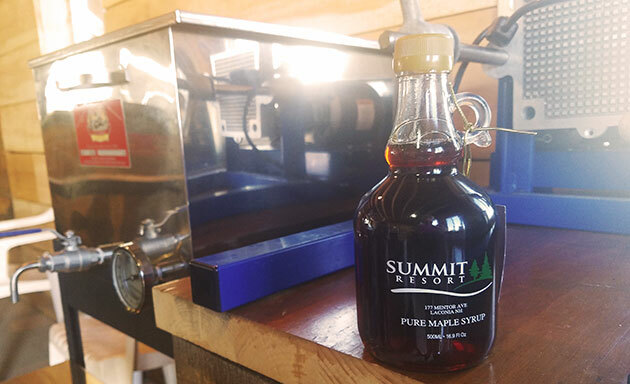 After returning to the resort, stop into The Market, our onsite convenience store, to pick up your very own 500ML bottle of pure NH maple syrup produced by Tim right at HT Farm. In the morning you can whip up some pancakes in your 2-bedroom suite’s fully equipped kitchen and top it off using your newly acquired liquid gold!